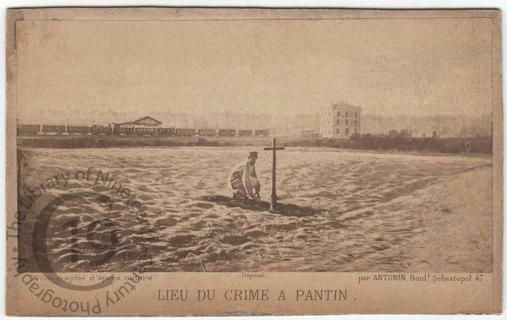 A carte-de-visite showing the location at Pantin, a northeastern suburb of Paris, where Jean-Baptiste Troppmann murdered eight members of the same family in 1869. Born in Alsace in 1848, Troppmann was twenty-two years old and working as a mechanic in Roubaix near Lille when he lured his employer Jean Kinck to a Parisian suburb and poisoned him with prussic acid. He then sent word to Kinck’s family, supposedly written by Kinck himself, asking them to send money. They mailed him a cheque but various attempts to cash it met with failure. Eventually Madame Kinck sent cash via her eldest son, Gustave, and Troppmann murdered him too. He then sent a message to Roubaix demanding further funds. This time Madame Kinck, seven months pregnant and accompanied by her five other children, brought the money herself, some 55,000 francs. Troppman killed them all and buried their bodies in a shallow ditch. Troppmann was arrested at Le Havre on 22 September. On 12 November he made a full confession and on 31 December 1869, after a trial lasting five days, he was sentenced to death. He was guillotined at dawn on 19 January 1870. Photographed by Antonin of Paris. According to a report from Paris, written when the bodies of Madame Kinck and her younger children had been discovered but before the discovery of the bodies of Monsieur Kinck and his eldest son, ‘The Pantin massacre continues to eclipse and push aside every other topic. Paris is mad about it. The excitement caused in London by the most celebrated and sensational crimes perpetrated in England in our day [..] does not, if my memory serves, anything like equal that which now here prevails. It is a passion, a rage, a fury, an insanity. Some of the papers fill their columns with scarcely anything else’ (The Times, 28 September 1869).